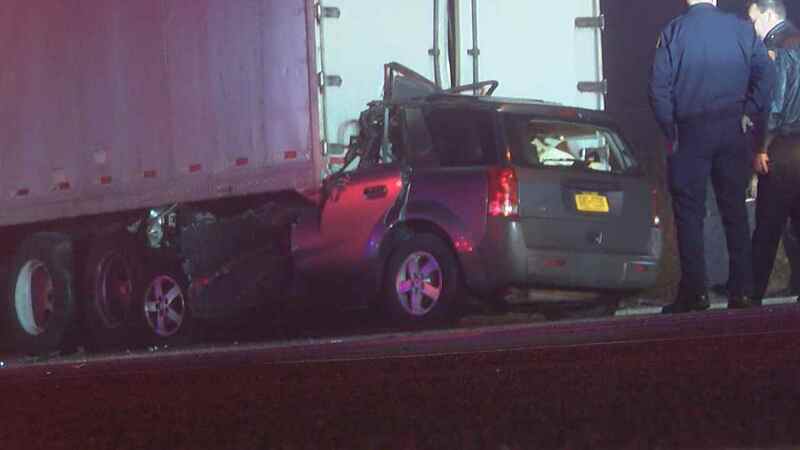 A driver was killed after an SUV crashed into the back of a parked tractor-trailer on Long Island overnight Wednesday. MORICHES, Long Island (WABC) -- The driver of an SUV died when the vehicle crashed into the rear of a tractor-trailer in Moriches overnight Wednesday. The vehicles crashed on Montauk Highway at Fanning Landing Road just before 3 a.m.
Daniel Krehl, 31, of Mastic Beach, was driving a 2005 Saturn Vue east on Montauk Highway near Fanning Landing Road when his vehicle hit a tractor-trailer, parked with its flashers on. Krehl was pronounced dead at the scene. Heavy fog conditions were reported at the time of the crash. The investigation is continuing. Anyone with information on the case is asked to call at 631-852-8752.